i fold with the hand i was dealt is the second book of poems from the bare-fisted poet Peter Carlaftes, and this insightful collection takes the reader on a thoroughly re-imagined joyride from birth through death via past and beyond. Carlaftes offers a brilliant poetic voice, filled with drop-dead humor, searing insight and resilient originality, even while resonating with overtones of Bukowski, Baudelaire and Vonnegut. A poem from the collection, “The Next to Last Wave,” was nominated for a Pushcart Prize. Carlaftes is an NYC playwright, poet, and performer; author of 12 plays, including a noir treatment of Knut Hamsun’s Hunger, and his own celebrity rehab center spoof, Spin-Dry. i fold with the hand i was dealt is his fourth book (the others being — A Year on Facebook (humor), Drunkyard Dog (poetry) and Triumph for Rent (3 plays), all on Three Rooms Press). He is co-founder and editor of Three Rooms Press; their most recent books include Maintenant 6: A Journal of Contemporary Dada Writing and Art; Have a NYC: New York Short Stories; and Mike Watt: On and Off Bass, a collection of photos and distilled tour diaries from the great punk rock bass player. Carlaftes is the author of six chapbooks including The Bar Essentials, Sheer Bardom, Nightclub Confidential and Progressive Shots (all Three Rooms Press). Nine of his original plays have been staged to critical acclaim, including Anity, Spin-Dry, Handout, and Closure. He has also written and performed his one-man show, Lenny Bruce: Dead & Well, and is the author of two other books: A Year on Facebook (humor) and Triumph for Rent (three plays). 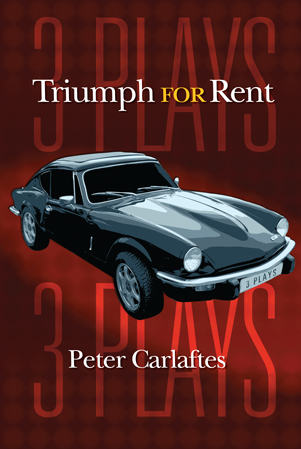 Playwright Peter Carlaftes presents three compelling, funny and biting dramas in TRIUMPH FOR RENT: Three Plays (Three Rooms Press, 184 pages, 2010, ISBN: 978-0-9840700-6-0). The plays include SPIN-DRY: An hilarious wild ride through a 90s rehab center for celebrities; HUNGER: a heartfelt drama—inspired by the Knut Hamsun novel—about a starving writer trying to survive and keep his integrity alive as the borders blur between fantasy and reality in a world of rocker chicks, hookers and convicts; and FRONTIER-A GO-GO, a tragi-comedy in which a man living on a man living on the Nebraska plains circa 1872 uses a time machine to summon a hippie drifter and a budding feminist who have just conceived a daughter at a rock concert in 1972, and then summons the daughter, aged 25, from her 1997 date with a cybergeek. 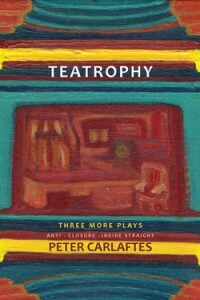 Peter Carlaftes began his theatrical career on the playgrounds of the Bronx, and after seeing the world, branched out to Manhattan. Nine of his plays have been staged, to critical acclaim, among them Anity, Frontier A-Go-Go, Spin-Dry and Closure. He also created and staged a deconstruction of Knut Hamsun’s classic novel Hunger, and created and starred in a one-man rendition of Harold Pinter’s The Homecoming. He has recently written and performed his solo work, Lenny Bruce: Dead & Well, and starred in numerous Off-Broadway plays. 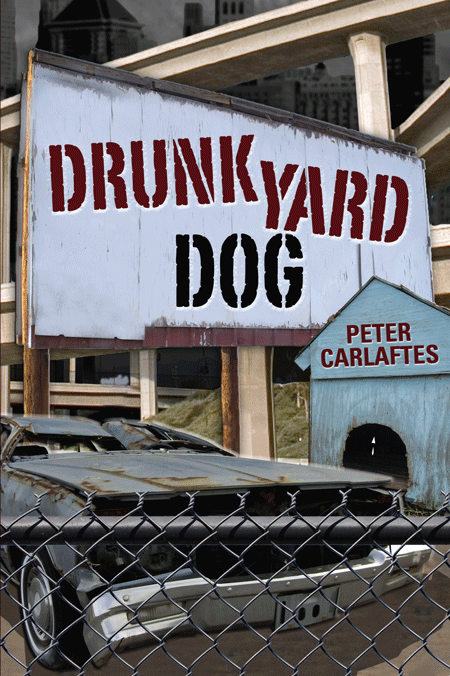 In addition to his theatrical career, Carlaftes is the author of two other books on Three Rooms Press: A Year on Facebook (humor), and Drunkyard Dog (poetry). Groucho Marx meets Kurt Vonnegut and they become BFFs in this irreverent, hilarious new book. A Year on Facebook is a comical trajectory through modern American life via daily updates from the insightful and irreverent pontiff of pun—Peter Carlaftes. In this day of the tell-all journal, Carlaftes’s book, exposing the foibles of our seemingly civilized sensibility, tells both how — and like — it is. Iconic from conception, A Year on Facebook is a one of a kind literary experience that raises the bar for the idealist in us all. 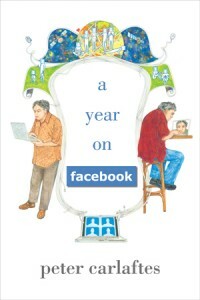 Through the hysterical daily Facebook status updates of the author— who became a viral Jonathan Swift through his irreverent social, political and just plain “out-there” observations—A Year on Facebook provides an hilarious book to thumb through at random or read page-by-ROTFL-page. It’s packed with side-splitting illustrations, and “interactive” pages that provide a multimedia experience for the reader in combination with the book’s namesake website. 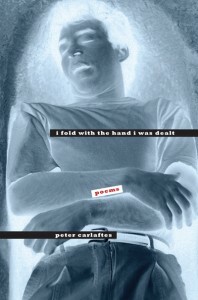 PETER CARLAFTES is a New York-based performance artist, playwright, fiction author, actor, and poet. 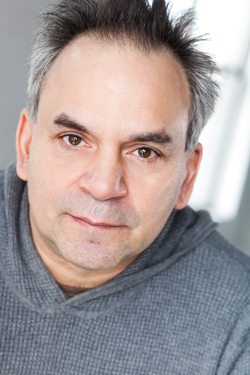 He is the author of twelve plays, including a noir treatment of Knut Hamsun’s “Hunger” and his original celebrity rehab center spoof, “Spin-Dry.” He has appeared in numerous Off-Broadway productions, including his comic solo performance piece, “Lenny Bruce: Dead & Well,” as well as “Barefoot in the Park” and Stephen Adly Guirgis’ “Den of Thieves.” Carlaftes books include A YEAR ON FACEBOOK (humor), DRUNKYARD DOG and I FOLD WITH THE HAND I WAS DEALT (poetry), TRIUMPH FOR RENT (3 Plays) and TEATROPHY (3 More Plays). He is co-editor of the annual Dada writing and art journal, MAINTENANT and the annual New York-based short story collection, HAVE A NYC. He is co-director of Three Rooms Press, a fierce, New York-based independent publisher inspired by Dada, punk and passion. He lives in New York City.